Cost: Entrance into the park and the displays at the visitor Center are free. You do have to pay for the cave tours. They start at $7 for a basic tour and range all the way to $55. Most tours are less than $20 a person. Camping is $20 at the Mammoth Cave Campground. Operating Seasons and Hours: The park is open all year long. Visitor Center hours are generally 8:00 am to 6:00 pm with shorter hours in the winter. Check the official website for cave tour hours. This was the first stop of the fifth and last day of my family's road trip to Tennessee and Kentucky in the fall of 2016. We camped nearby at the Bailey's Point Campground, and drove into Mammoth Cave National Park in the morning. Last April, my sister and I got together for an unusual sister's weekend. We met up in Indianapolis, Indiana so that we could help my grandma move to my sister's house in Houston. My sister flew from Houston and I drove up from Alabama. The drive from Alabama to Indianapolis was basically a straight shot up I-65 through Alabama, Tennessee, Kentucky, and Indiana. As I passed through Kentucky I saw signs for Mammoth Cave National Park. A quick look at the map confirmed that the national park wasn't that far from the interstate. I was tempted to take a little detour into the park, but decided against it because I still had a lot of driving to do, and my sister was depending on me to pick her up at the airport. 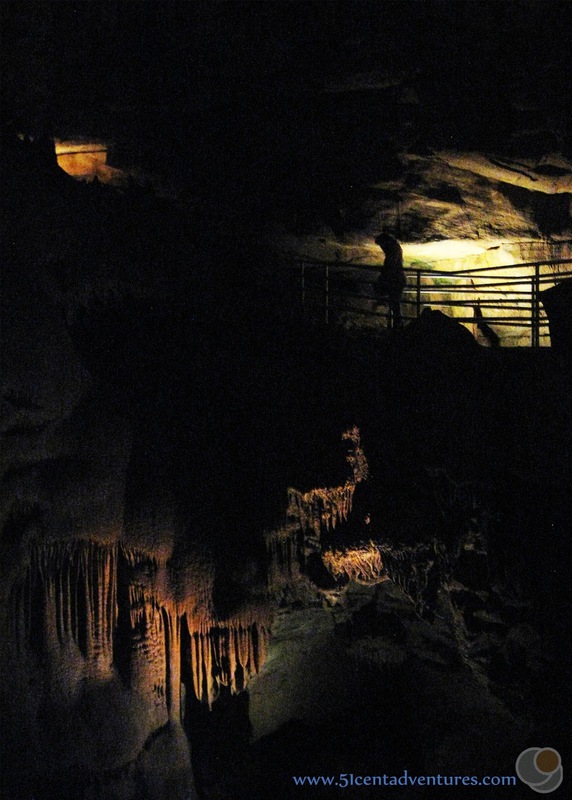 That road trip showed me that Mammoth Cave wasn't really that far from our home in Alabama. I decided that I should plan to come back to the cave with my family before we moved away from the South. Later that year my family started making plans for our move back to Utah. I wanted to make sure we included a stop at Mammoth Cave on our route. I figured it would be fairly easy to head north to Kentucky before turning west toward Utah. As the date for our move kept getting pushed back I decided that we should just plan a trip to Tennessee and Kentucky for Columbus Day weekend. And that is what we did. We spent the first part of the trip in the Smoky Mountains of Tennessee before travelling into Kentucky. Visiting Mammoth Cave was the last thing we had planned before it was time to drive back to Lower Alabama. This would be the third cave we visited in 2016. The first, Florida Caverns State Park in Marianna Florida, was actually the first cave we'd visited as a family since 2012. That cave tour had gone so well that we decided to visit Ruby Falls in Chattanooga, Tennessee in April. And now we were going to do a tour of Mammoth Cave. Mammoth Cave is actually a huge network of interconnected cave passages. Seeing the entirely of the cave in one tour would be physically exhausting. So the national park offers a variety of cave tours ranging from easy to difficult. The prices vary as well. The easiest and shortest tour is only $7 and the hardest and longest tour is $55. At first I was attracted to the Frozen Niagara Tour for $13 for an adult ticket. This would allow us to see one of the most well known part of the cave. But then I noticed that the Domes and Dripstones Tour was $15. For only two dollars more we would be able to see the Frozen Niagara formation as well as more of the cave including a 280 foot staircase. I figured that our children had done well on the other two cave tours that we'd been on that year so we might as well go all in and do the longer tour. 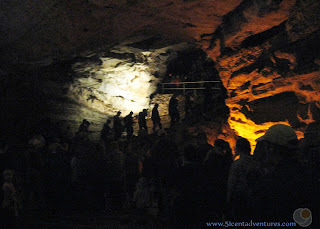 I want to mention that all the Mammoth Cave tour prices are very inexpensive when compared to many other caves. 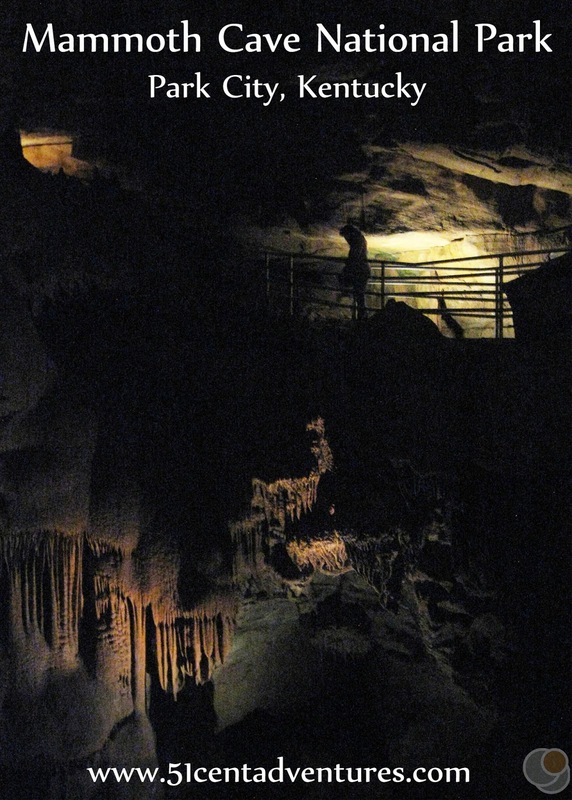 Generally cave tours cost about $20 for an adult and $12 for children over 3. 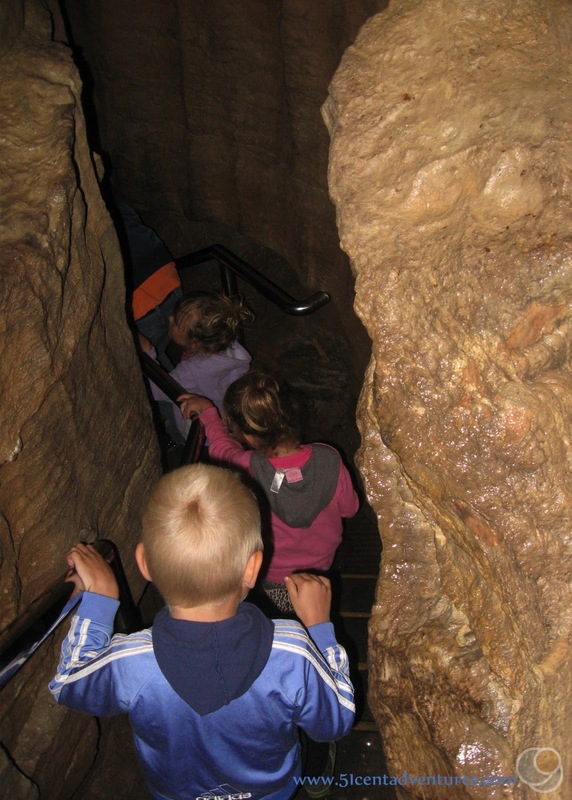 Most of the Mammoth Cave tours are about $16 or less for an adult and $10 or less for children ages 6 to 12. 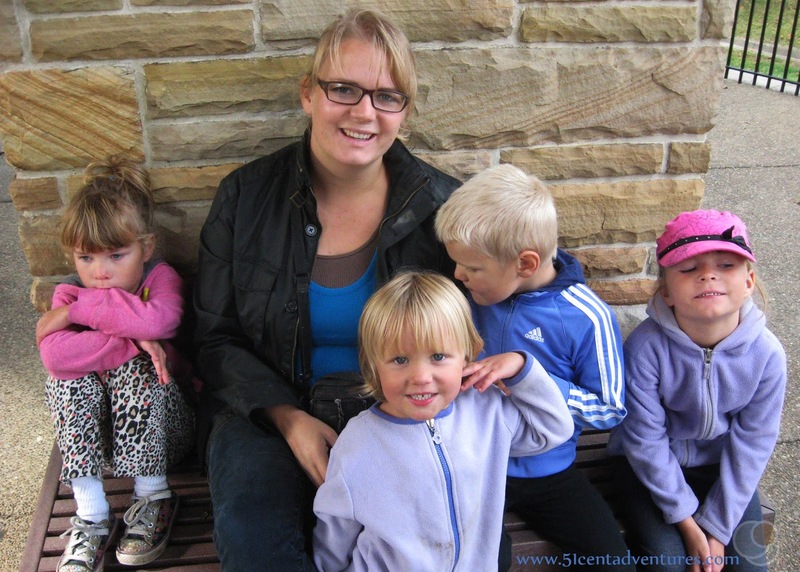 My kids were all still under the age of 6 so they were all able to go on the tour for free. We were able to go on this tour for only $30 for the six of us. Contrast that with the $76 we'd paid for the Ruby Falls Tour, and you can see why I consider Mammoth Cave to be inexpensive. A few weeks before our trip I paid for our tour tickets using recreation.gov. I'd actually confused the dates and scheduled the tour on Monday instead of Tuesday. When I realized my mistake I thought it would be a huge hassle to get the ticket dates changed, but really all it took was a short phone call to the customer service line. I was duly impressed by the quality of their customer service. When we arrived at the park we picked up our tickets at the Visitor Center and then waited for our turn to ride a bus to the cave entrance. This was different from every other cave tour I've ever been on. Usually the cave entrance is within a few feet of where you buy tickets. 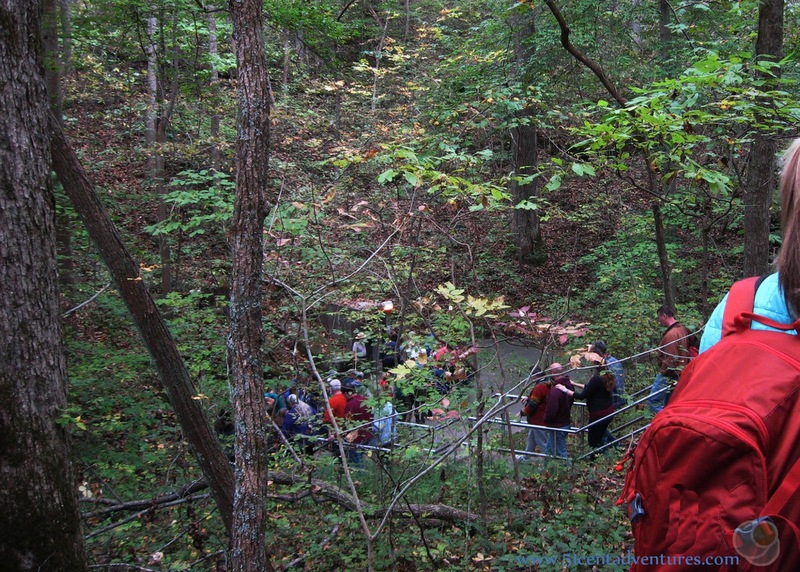 But Mammoth Cave has many different types of tours and the entrances to those tours are spread throughout the park. So it makes sense to have one ticket location and then take a shuttle bus to the entrance for the tour. There was a really nice display area in the Visitor Center with information about the cave. We looked at that for a little while. But soon we went out to the pavilion to meet up with our tour group. 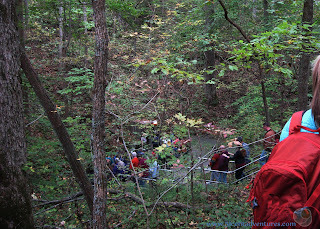 Our group had about 120 people in it which was another difference from other cave tours I've been on. Usually we are in a group of about 20-30 people, but this group was massive. I guess with a cave as large and as popular as Mammoth Cave you can have large groups. A park ranger gave us some safety instructions as we waited for our bus. Then we were allowed onto the buses. Our group filled three buses. We rode in the buses for about 10 minutes. All my kids were super excited to ride on the bus. When we arrived at our destination we had to walk down some steps to get to the cave entrance. Then we went through a door and were inside the cave. The first part of the tour involved walking down 280 steps. The steps wound around and through a narrow passage between walls of stone. We would have a huge empty space above our heads, and then turn a corner and be staring down a deep pit. The engineering involved in putting in these steps was astounding. Finally we entered a large cavern. How large was it? Well there was enough seating in the cavern for all 120 people in our tour to sit down. The tour guide gave some history of the cave while everyone sat on benches. Unfortunately, I didn't hear any of what he said. My three year old daughter had been upset from the moment we got off the bus. (She was mad that we didn't let her walk down the bus steps by herself.) Then she was upset the whole way down the cave stairs and insisted on being carried - by me. My four year old son had done well on the way down the stairs, but he was scared of the big room with lots of people in it. He has sensory issues and was having trouble every time the large group of people laughed or clapped. So my husband and I sat in the back of the group trying to keep our kids quite so the rest of the people could hear the park ranger. Then it was time to keep moving. Most of the pictures I took in the cave aren't very good. We couldn't use flash photography in the cave and my camera doesn't take very good pictures in low light. (To say nothing of the fact that I was trying to take pictures while holding a three year old.) But I do like this picture of the silhouettes of people going up a ramp. The tour could be broken up into three parts. The staircase, the corridors and caverns, and the decorative formations. The middle part of the tour where we walked along rock corridors to reach rock rooms wasn't that amazing. Sure it was cool to be in such a large cave, and some of the caverns were truly mammoth, but there weren't really any interesting features. 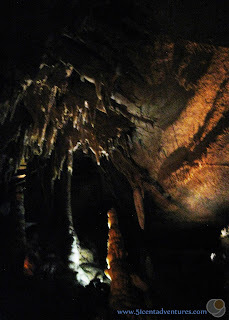 Most other cave tours are full of amazing limestone features everywhere you look. This part of the tour was surprisingly empty of anything of interest. At the end of the tour we reached the famous Frozen Niagara formation. This is where I felt the cave became truly spectacular. 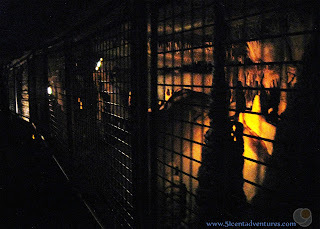 We descended more stairs and were able to get very close and even under a massive formation of stalactites known as the drapery room. It really was like being near petrified water. After we came back up from the Frozen Niagara we were able to walk around the formation and toward the cave exit. The last section of the cave was a corridor with many decorative formations on either side. This is the most visited section of the whole cave and so there was a fence in place to protect the formations from overeager tourists. My three year old was finally enjoying the cave by the time we reached these formations. She kept pausing and saying things like "ooh castle." But the rest of the kids were pretty much done. After two hours underground they were ready to see some daylight. They rushed through this section of the cave and were rewarded with the exit. 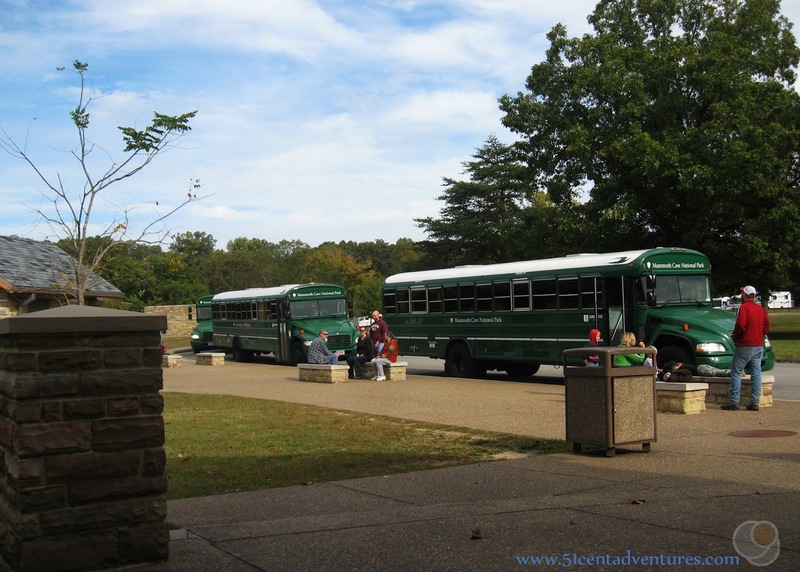 A bus met us outside the exit and took us back to the Mammoth Cave Hotel that is next to the Visitor Center. When we exited the bus we had to walk across a bio-mat to make sure we didn't carry any cave germs on our feet to other caves. 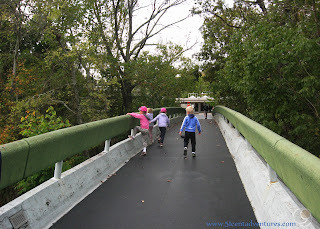 We slowly walked across the bridge that connects the Hotel to the Visitor Center. A walkway underneath the bridge lead to the Historic Cave Entrance. If we'd had more time and energy I would have loved to walk down to the historic entrance of the cave. We also could have paid for another tour of that part of the cave. Unfortunately we had to start our 7 hour drive back to Alabama. In a way it's good that we had to get back into the car because the cave tour completely wiped us out. My arm was sore from carrying my daughter, and the kids were all exhausted from trekking through the cave for two hours. Further exploration of Mammoth Cave will have to wait until we are lucky enough to be near Kentucky again. Recommendation: Mammoth Cave was a great experience, and I'm so glad we made time to visit it while we still lived nearby. If you live, or will be travelling, near Mammoth Cave you should plan to visit the cave. 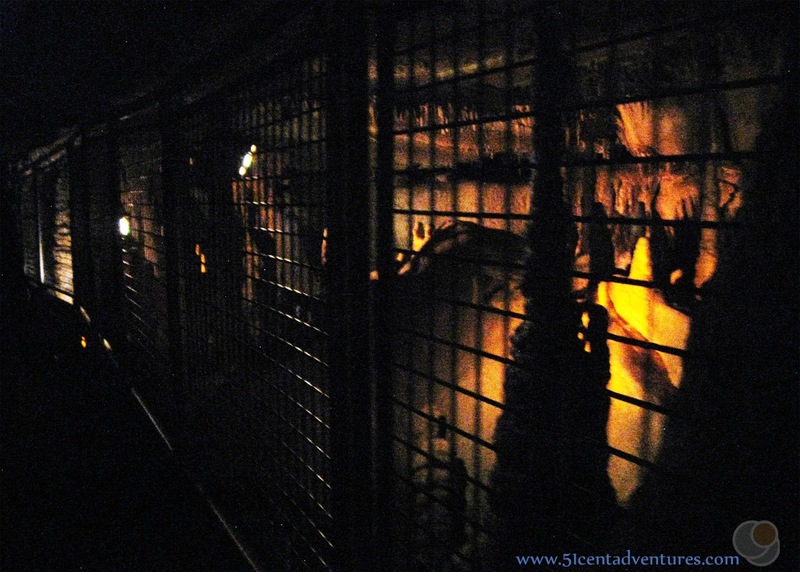 There is sure to be a cave tour that fits your physical abilities. What's really nice is that all the tours are reasonably priced. Even if you don't want to go on a tour, the displays in the Visitor Center are worth a look. Directions: Apparently GPS directions to the Visitor Center cannot be trusted because the park has this message displayed on various parts of their website: Please take note! Do not rely exclusively on your mobile GPS, Google Maps™ or similar automated navigation system to get your to the park Visitor Center in time for your Cave Tour. Numerous visitors trusting in navigation devices have reported that the device or service has taken them the long way around by way of the park's north side and required a river crossing by ferry, or backtracking over many miles, to reach the Visitor Center. The best way to reach the Visitor Center is to travel on I-65 and take the Exit for either Park City or Cave City. Then follow the signs to the Visitor Center. 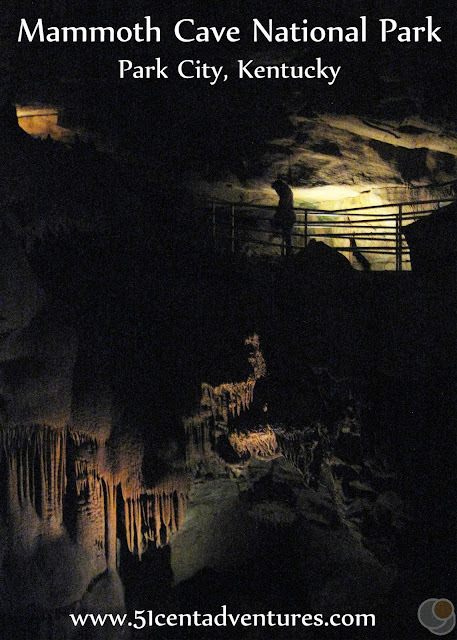 Places Nearby: Mammoth Cave is part of a network of caves in this region of Kentucky. There are several other places offering cave tours. Diamond Caverns is less than 10 miles from Mammoth Cave. It is privately owned, so the prices are a bit more expensive, but there are many beautiful formations that probably make it worth the price. Next Stop: This was the last stop of note for this particular road-trip. However, within a few days of coming home from Kentucky we finally received exact moving dates from the Army. Six weeks later we were heading back to Utah. Our first stop on that trip picked up where our Tennessee/Kentucky road trip left off. So we'll just pretend that it was our next stop on this trip. 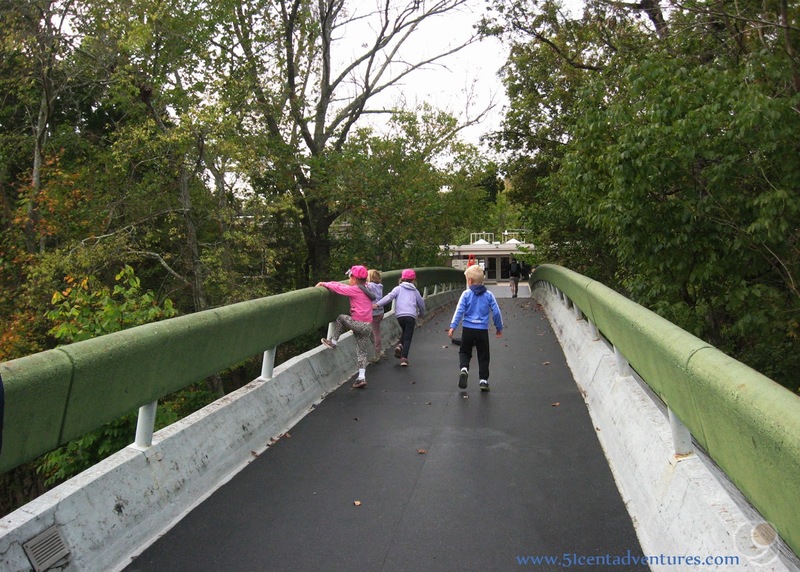 It was the Mississippi Observation Deck in New Madrid, Missouri.